The last decade of the twentieth century witnessed rapid changes not only in global politics but also in Taiwan's quests for new identities. The notorious martial law was lifted in July 1987, and long-repressed calls for democratization began to be heard that caught worldwide attention. In tandem with economic transformation, the entire world of thought in Taiwan underwent significant changes. 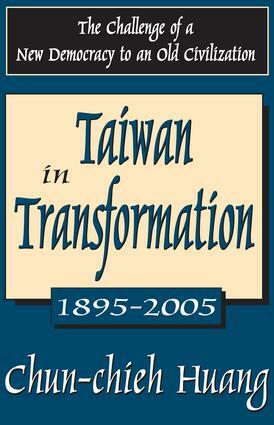 Both economic and ideological restructuring have been basic elements of transformation in postwar Taiwan. However, rapid democratization has opened a Pandora's box, and stirred a whirlwind of discord. This volume elaborates on the "where from" and the "where to" of the Taiwan transformation and attempts to answer such questions as: Is the old Taiwanese work ethic just a relic of the past? Is Taiwan going to become an Armageddon of ideological wars? Chapters deal with the vicissitudes of Taiwanese nostalgia for cultural China; postwar Taiwan in historical perspective, in particular the rise and fall of the agrarian culture; the transformation of farmers' social consciousness in the period 1950-1970; Confucianism in postwar Taiwan: historical, philosophical, and sociological; the case of Hsu Fu-kuan, which provides an epic case of the intertwining of cultural crisis with personal crisis; the development and metamorphoses of Taiwanese consciousness in the unfolding political context, the awakening of the "self"; and finally "mutual historical understanding" as the basis for Taiwan-Mainland relations in the twenty-first century. Taiwan in Transformation seeks to show that historical insights extrapolated from an understanding of history are essential for grasping and solving the basic problems facing Taiwan at present, including the Taiwan-Mainland relationship in the twenty-first century. It will be of interest to Chinese area specialists, sociologists, and historians.